In recent Welsh National Opera and BBC National Orchestra Wales performances, percussion sections were brimming with Royal Welsh College talent. Through placement schemes taken while training at the College, many musicians have formed lasting industry links that carry them into their careers. We caught up with a few recent percussion graduates to see where they are now. An impressive 7 out of the 10 percussionists needed to perform BBC National Orchestra of Wales’ 2016/17 season finale were RWCMD alumni, pictured above. The repertoire featured both the Prokofiev Scythian Suite and Stravinsky’s The Rite of Spring. 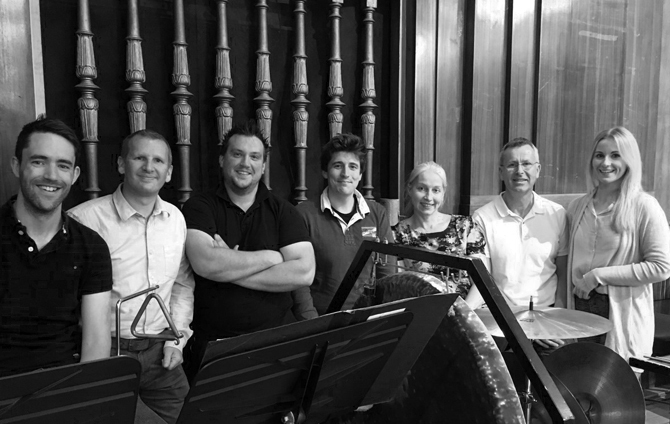 Among several RWCMD alumni, recent graduates Paul Stoneman, Rhydian Griffiths and Max Irelance currently all sit in the percussion section for Andre Tchaikovsky’s Merchant of Venice with Welsh National Opera. All three made their links with WNO through placement schemes taken while studying at RWCMD. Students can audition for the unique opportunity to ‘sit in’ and play in WNO rehearsals.